The attempted murder of a rap mogul Suge Knight in a Sunset Strip nightclub early Sunday morning has striking parallels to another even more brazen — and more historically significant — assassination attempt against a powerful underworld figure on the Strip 65 years earlier. Knight, 49, was shot inside the crowded club during a pre-Video Music Awards party hosted by Chris Brown. Police say a gunman approached him and opened fire, hitting him six times and wounding two others, an unidentified man and woman. All three are expected to recover. “We believe it was a crime of opportunity,” a Sheriff’s Department investigator told the Los Angeles Times. Knight, who made millions producing and distributing rap music in the 1990s, has ties to the Piru Bloods of Compton. The target of the 1949 assassination attempt was mob boss Mickey Cohen, 35, the powerful head of the national crime syndicate’s multimillion dollar illegal gambling and vice operations in Southern California. At the time of the attack, he was embroiled in a gang war gripping Los Angeles. Earlier in the year, his accusations of corruption against senior LAPD officers had launched highly publicized investigation into vice racketeering in the top ranks of law enforcement. Violent gunfire early today cut down Mickey Cohen, a state bodyguard, an associate and a girl. 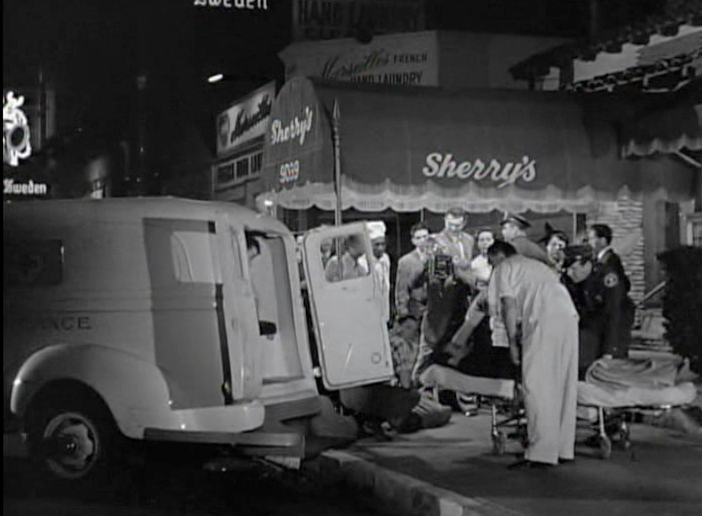 As the Cohen party left Sherry’s Restaurant 9039 N. Sunset Blvd., at 3:55 a.m., four shots rang out to strike the victims. Cohen, struck in body and shoulder, received intravenous injections to save his life. Also wounded was Harry Cooper, special agent from the office of the California attorney general assigned yesterday to be a personal bodyguard to the dapper racketeer. Cohen needs protection because he fears eastern gangsters are here to assassinate him. Also injured were Edward (Neddie) Herbert and Miss Dee David, a blond. Herbert escaped 11 bullets in a attempt on his life a month ago. Cohen’s henchmen did not return fire. Mickey Cohen may have told reporters he feared “eastern gangsters,” but he had deadly enemies much closer to home. Chief among them was Jack Dragna, who had once controlled Los Angeles gambling and other vice enterprises. Dragna’s supremacy ended in the early 1930s when the national syndicate sent Bugsy Siegel to assume control of West Coast operations. Using diplomacy backed up by brute force, Siegel managed to keep the peace for roughly a decade, until his assassination in 1947. War erupted when the East Coast bosses promoted Mickey Cohen into the top spot instead of Dragna. Since then, Cohen and his men had been targeted on multiple occasions, the most dramatic of which had occurred 11 months earlier when a hired assassin, Frank (“The Bomp”) Bompiensero, breached Cohen’s headquarters below his haberdashery at 8804 Sunset on the Strip. Cohen escaped injury by hiding in the a washroom, but two of his bodyguards were wounded and another, Harry (“Hooky”) Rothman, was killed. The Bomp’s role in the haberdashery incident was revealed years later by his runner, Jimmy (“The Weasel”) Fratianno, who said he placed the hit on Dragna’s orders, but no one has ever taken credit or blame for the hit at Sherry’s. Like the attack on Suge Knight, the ambush at Sherry’s made the national news, thrusting the mob war for control of gambling on the Strip into the spotlight. Calls to clean up the Strip came from Gov. Earl Warren in Sacramento as well as the Truman White House and J. Edgar Hoover at the FBI. The crack down on mob activity on the Strip that ensued eventually drove the syndicate’s multimillion-dollar illegal gambling operations off the boulevard, notably to Las Vegas. By the end of the 1950s, the Strip’s glamorous heyday as Hollywood’s playground was over. With many erstwhile A-list clubs and cafes standing empty, lease rates plummeted. The boulevard’s depressed rents combined with its world-famous brand made it an ideal location for a new wave of music impresarios, setting the stage for the Strip’s next incarnation as a rock ‘n roll mecca. In the 1960s, the former Sherry’s building became Gazzarri’s, a mainstay in the Strip’s rock scene. Gazzarri’s closed in the early 1990s, and the building was red-tagged for demolition after the 1994 Northridge earthquake. The current venue opened in 1996 and changed hands twice prior to the opening of 1 Oak. These two assassination attempts 65 years apart are similar in that both failed to take down their targets. In both attacks, the assailants escaped immediate capture. While the gunmen who ambushed Mickey Cohen have never been identified, whether the shooter in Sunday’s attack against Suge Knight will be caught remains to be seen. Look again. 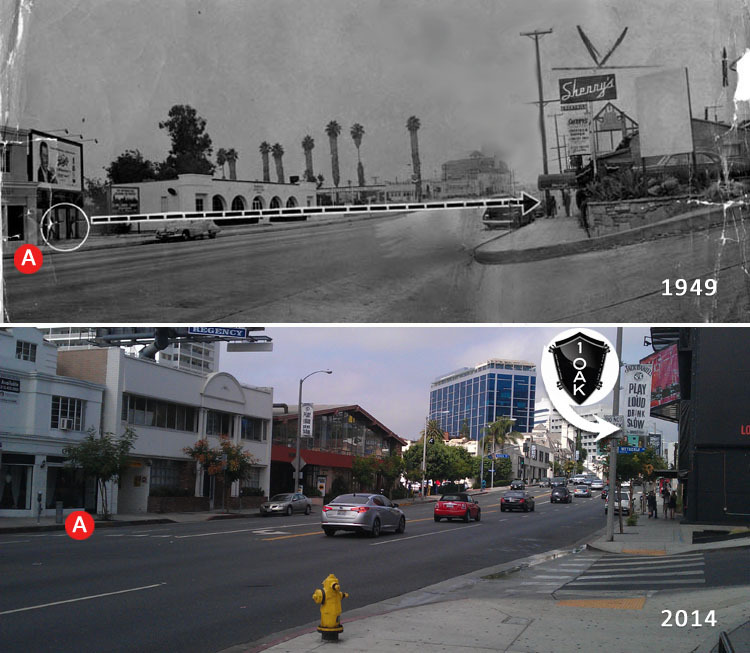 The Bing Crosby Building is across the street in both photos. I took the current-day shot myself. Thanks!